Deputy Secretary of State William Burns met Wednesday with Egypt's Muslim Brotherhood, the highest-level contact between the United States and the Egypt's largest Islamic group. The Brotherhood's Freedom and Justice Party won more than 40% of the seats in recent elections and is expected to lead the country's first parliament chosen since the ouster of former President Hosni Mubarak. State Department spokeswoman Victoria Nuland said Burns' meeting with party chief Mohammed Morsi was an opportunity to reinforce U.S. expectations that Egypt's new government will support human rights, women's rights and religious tolerance and support Egypt's peace treaty with Israel. The new parliament, which will be seated later this month, must appoint a panel to write a new Egyptian constitution. Secretary of State Hillary Clinton said Wednesday the Arab League monitoring mission in Syria could not continue indefinitely, as the U.S. Embassy reduced its staff in Damascus over concern about the security situation there. In a travel warning issued Wednesday, the State Department said it has ordered a number of embassy employees to leave the country as soon as possible. At a press conference with Qatar's prime minister, Sheikh Hamad bin Jassim al-Thani, Clinton said, "I think it's clear to both the prime minister and myself that the monitoring mission should not continue indefinitely." "We cannot permit Assad and his regime to have impunity," Clinton said, referring to Syrian President Bashar al-Assad. "Syrians deserve a peaceful transition." Secretary of State Hillary Clinton on Wednesday acknowledged discussions about opening up a Taliban office in Qatar, and transferring some Taliban prisoners at Guantanamo Bay, Cuba, as part of the U.S. support for Afghan reconciliation efforts. "Nothing has been concluded," Clinton said at a press conference with Qatari Foreign Minister Sheikh Hamad bin Jassim al-Thani. "We are still in the preliminary stages of testing whether this can be successful." Clinton said she's sending Marc Grossman, the State Department's special representative for the region, to Afghanistan and Qatar next week to work on the details. Clinton said positive statements made last week from both the Taliban and Afghan President Hamid Karzai suggest "there is support for such discussions, for the (Taliban) political office to open in Qatar." She said the U.S. government was "very grateful for the assistance that the government of Qatar has provided." A number of websites including TMZ and YouTube posted a video Wednesday showing four men dressed in U.S. Marine Corps combat gear urinating on the apparently dead bodies of three men sprawled on the ground in front of them. One of the men says, "Have a great day, buddy." A voice asks, "You got it on the video?" to which another voice responds, "Yeah." Another jokes, "Golden, like a shower." It was not clear who shot or posted the 39-second video, who the people pictured in it were or where it was shot. "We recently became aware of an inappropriate video on a public website that appears to involve members of our military," ISAF spokesman Col. Gary Kolb said from Kabul, Afghanistan. "We will not speculate on the details but will take all necessary actions to determine the facts." 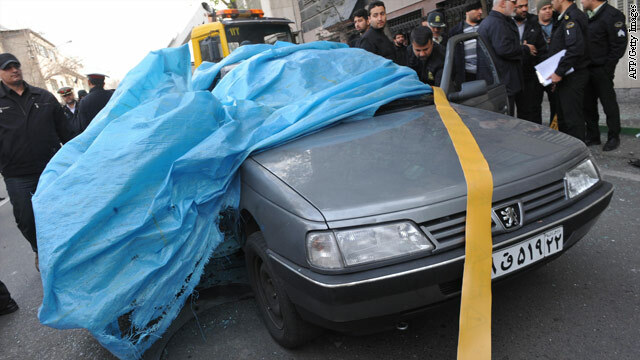 Iranian security forces inspect the site where a magnetic bomb attached to a car by a motorcyclist exploded outside a university in Tehran on January 11, 2012, killing a scientist and injuring two other people, according to Iranian news agencies. Most dangerous job in the world? A nuclear scientist was killed in a blast in a Tehran neighborhood Wednesday morning, an Iranian news agency reported, the latest in a string of attacks against such scientists that Iran has blamed on Israel. A motorcyclist placed a magnetic bomb under Mostafa Ahmadi Roshan's Peugeot 405, the state-run IRNA news agency said. The blast also wounded two others, IRNA said. State television channel Press TV reported later Wednesday that Roshan's driver, named as Reza Qashqaei, had died in a hospital from his injuries. Roshan, 32, was a deputy director for commercial affairs at the Natanz uranium enrichment facility in Isfahan province and a graduate of Iran's Oil Industry University, according to the semi-official news agency Fars. 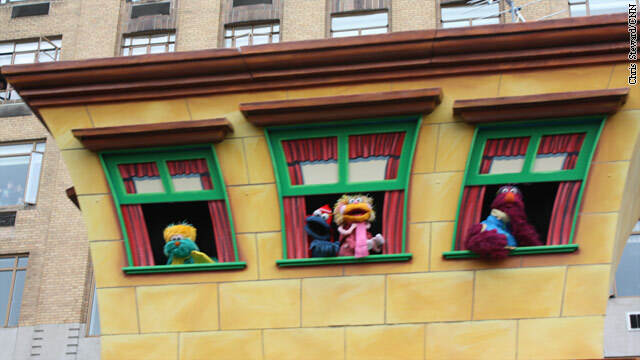 An Arab-language version of the American children’s program, Sesame Street, watched by kids in the Palestinian Territories, is on hold for this year, victim of a decision by the U.S. Congress to freeze nearly $200 million in funds to the U.S. Agency for International Development. Called “Shara’a Simsim” in Arabic, the program is aimed at youngsters in the West bank and Gaza and is funded through the USAID. State Department spokeswoman Victoria Nuland confirmed the cut-off Tuesday. “Unfortunately, Kermit is not able to be supported at this moment,” she said.